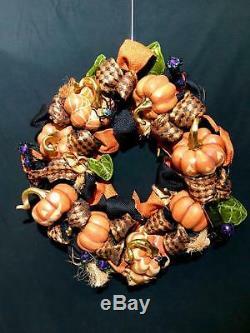 Fabulous Halloween Prototype Wreath by Katherines Collection. This is a great opportunity for you to own some of our best items at a much lower price than normal. Some are prototypes that were never released to the public making them even more special. On display in a showroom and have been handled by customers and employees. Be sure to visit the Sample Sale. 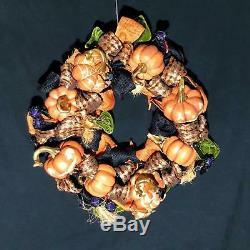 Extremely Rare Collectible Halloween Wreath by Katherine's Collection. It was on display in one of Katherine's Collections wholesale showrooms. We believe they only made a couple of this Halloween model ever. 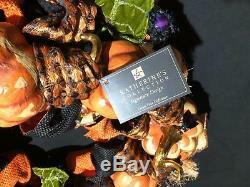 This fabulous wreath a must-have item for any serious Katherine's Collection collector. We can't say it's brand new because it is a prototype and was on display. We didn't notice any damage, but it may show some signs of being used and/or hung previously. It does look great overall, made with some beautiful ribbons and unique hand-painted pumpkins. Perfect for your Halloween décor and certain to be a. Cherished addition to your collection. It will also be an unforgettable gift for special friends & family. Katherine's Collection makes some of the most beautiful and unique creations in the world. We were collectors long before we were sellers of this amazing line. We're always a little sad everytime we sell one because we to keep them all. We hope you enjoy Katherine's Collection and their truly special designs as much as we do. We are an authorized Katherine's Collection dealer. These Sample Sale were on display in a showroom and may show some signs of wear or minor damage including, but not limited to: discoloration, rips, tears, dings, dents, scratches, scuffs, loose thread/s, fraying, frizzy hair or any number of other issues. Tags/labels and original boxes are often missing/not included. None the less these items are beautiful, full of character, and are fabulous. While some look brand new, and we think they all look fantastic on display, some will show some wear or damage as noted above (usually very minor). With most of the items we sell being handcrafted, it is not unusual for there to be imperfections and inconsistencies even in brand new ones. All items are AS IS. The included pictures generally show overall condition, but may not show every detail or every imperfection, damage, or signs of wear. On items that we have more than one of in stock, we will use pictures of one of the items only. It will likely not be the actual one you receive. However, others should be fairly similar. We like the character of these items not being perfect. Some of our customers dont mind some minor repair, touchups, sewing, etc. However, we understand if you want one that hasnt been handled. We reuse and recycle packing materials when possible. If you would like to see additional photos or have any questions, please let us know before purchasing. Boxes are often opened and contents inspected for quality control purposes. Due to the hand-crafted and/or hand-painted nature of most items, color, size, and details may vary from piece to piece. As with most items of this type imperfections and flaws are normal and part of their charm. FEEDBACK: Your business and satisfaction are very important to us. Artistic, creative, fun and unique items for people that love show off unusual designer quality collectibles. It goes without saying that they make great conversation pieces. Check back often as we are always adding new treasures. The item "Katherines Collection Rare Prototype Halloween Wreath w Pumpkins & Ribbon" is in sale since Monday, October 1, 2018. This item is in the category "Collectibles\Holiday & Seasonal\Halloween\Current (1991-Now)\Decorations\Other Current Halloween Décor". The seller is "ravenbluellc" and is located in Northridge, California. This item can be shipped to United States.